Most basketball players compete on courts made from hardwood, which provides a smooth, unobstructed surface and a consistent bounce. Yet not all basketball courts feature the same playing surface. The court’s surface will depend largely on the needs of the specific court and its location, with varying materials needed for outdoor play. 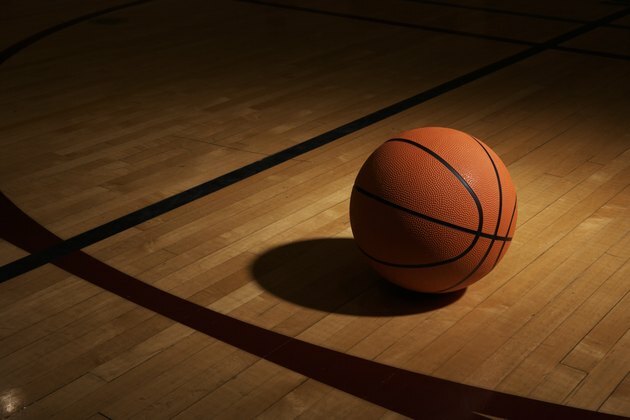 The most popular choice for indoor basketball courts, hard maple flooring can be found in most NBA stadiums and premier NCAA arenas. Hard maple is a dense wood with fine fibers, making it particularly resistant to splintering. The wood’s tightly packed grains also yield a smooth surface with no room for dirt and grime to hide. As a result, hard maple courts offer exceptional durability and require little maintenance. Hard maple and other wood surfaces, like maple-oak blends, shouldn’t be used for outdoor courts because sunlight, rain and other natural elements may damage the wood and warp the surface. Many basketball players first learn the game on outdoor courts, either at community parks or on their neighborhood streets and driveways. Standard asphalt remains the most common outdoor basketball court surface due to its strength and ability to withstand harsh weather conditions. Unfortunately, asphalt will break down over time and can be prone to cracks, chips and other surface imperfections. Asphalt can also contribute to injuries, especially on falls where its unforgiving nature can lead to cuts, scrapes or worse. Several manufacturers produce basketball court surfaces from multi-purpose plastic flooring. Court construction begins with a smooth slab of concrete for a sturdy foundation and then features a top surface of modular polypropylene squares snapped together in any shape or design. The plastic flooring provides excellent traction, a reliable ball bounce and enhanced safety, including minimal skin abrasions on falls. Such multi-purpose surfaces can handle the rigors of basketball or even other sports like volleyball, street hockey, tennis and soccer. Users may even customize the courts, ordering the floor in a multitude of colors to match team uniforms or other stylistic preferences. These multi-purpose surfaces also can withstand outdoor elements or be applied indoors without any loss in performance. Some multi-purpose courts may include advanced features to aid responsiveness and playability. For instance, companies produce a number of advanced surface solutions, including flooring with a rubber layer between the concrete foundation and the polypropylene plastic surface for greater shock absorption and sound dampening. Some surfaces also feature a polyurethane finish atop the plastic flooring to further enhance durability and moisture resistance.